Section 3 – 5-6 years: activities to develop the fine motor skill prerequisites necessary for learning to write. 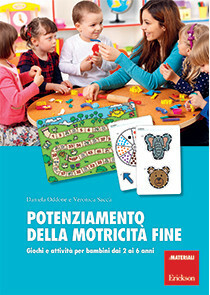 Equipped with more than 20 full-colour worksheets and materials, including a board for an original board game, Improving Fine Motor Skills is a valuable tool for parents, educators, kindergarten teachers, practitioners and therapists working with children with learning difficulties and can be used both at home and in education and rehabilitation. This volume, created by the psychomotor specialists Daniela Oddone and Veronica Saccà, proposes "do-it-yourself" activities and games to be carried out with readily available materials to stimulate fine-motor skills in children aged 2 to 6 years.